Siesta 35 - Chakas Rock / Shakas Rock Accommodation. 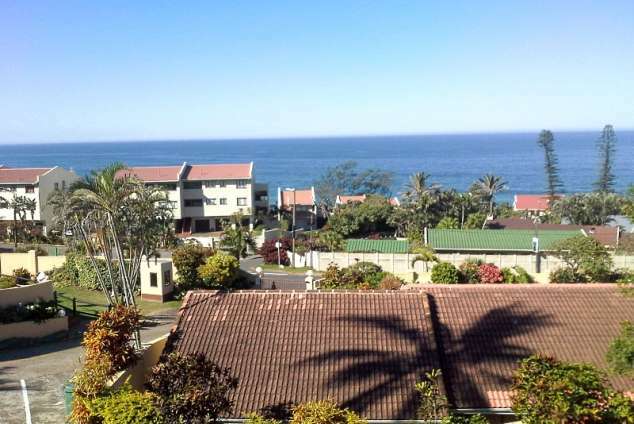 Spectacular sea views from this lovely furnished fully equipped spacious apartment which sleeps a maximum of 6 people. This apartment consists of 3 bedrooms - 1 en-suite with Queen size bed, 2nd bedroom has 2 single beds and 3rd bedroom has 2 bunk beds. The main bathroom has a bath/shower, toilet and basin, and the en-suite bathroom has a shower, toilet and basin. Ceiling fans in all 3 bedrooms and lounge. The kitchen is open plan onto the lounge, and is equipped with a stove, washing machine, tumble drier, fridge, freezer, cutlery & crockery. There is full DSTV and Wi-fi available. The lounge area overlaps between the kitchen area and leads onto a large covered verandah, where you have a beautiful sea view and can watch the sunrises and sunsets. This large verandah area is equipped with tables and chairs and has a gas braai for sociable evenings, even if it does rain. There is a communial pool in the complex. Within the vicinity guests can walk to Thomsons Bay Beach and tidal pools, which is a sheltered cove providing a great place for swimming and angling. Just down the road is Salt Rock Beach with picnic areas, showers and a massive tidal pool. Beaches are protected by shark nets and fully trained lifeguards. For the kids, nearby is a fun packed animal farm which is sure to give all a memorable experience. Golfers will also be able to enjoy 9 holes at Umhlali Country Club or Simbithi Country Club which is only minutes drive away. Deep sea fishing trips can also be arranged with local fishing charters. There is also easy access to various shopping centres and restaurants in the area. It is necessary to bring your own beach and bath towels. There is no cleaning service, but this could be arranged upon request and subject to availability at an extra cost. 1133 page views since 21 May, 2018. Last updated on 27 Jul, 2018.